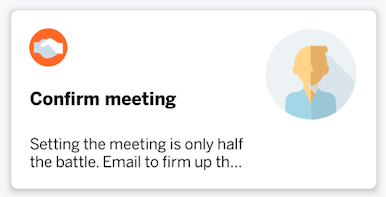 Your Spiro Assistant uses artificial intelligence to make recommendations on who you should call, encourages you to confirm meetings and helps keep your opportunities up to date. Below are some recommendations you might see from your Assistant tab in Spiro. By creating an opportunity, you’re telling Spiro that you are trying to close a deal with a specific company or contact. Your Assistant monitors your opportunity activity and makes proactive recommendations on who you should call each day to be sure no deals fall through the cracks. 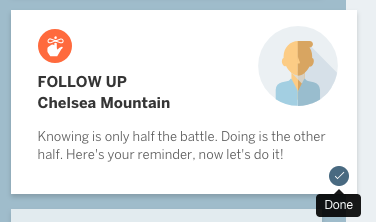 View your daily reminders (and past due reminders). You can update reminders using the "Not Now" button or circle with arrows icon in the reminders section. To mark a reminder as done, click the done button to close to reminder card and move on the next. Based on email activity, your Assistant will ask if you want a contact, company and opportunity created for contacts you are emailing that are not in Spiro. Click into a reminder to view contact and opportunity information. 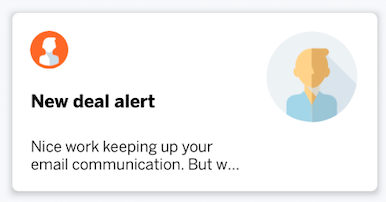 A list of actions will appear so you can quickly call, email, update reminder date and time or log activity and move on to your next reminder. 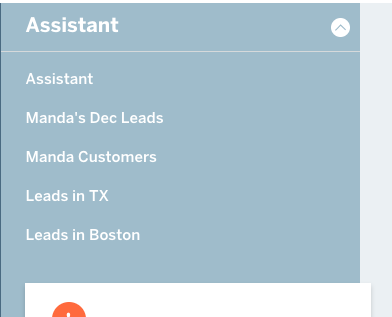 You can access Campaign lists you create the Assistant. Click the "Assistant" bar at the top of the screen to access your Campaign Lists and call right from Spiro.